Associate Professor of Law at Lewis & Clark Law School. Join him at ozanvarol.com. "Give me a place to stand on, and I will move the Earth." Books are to me what the lever was to Archimedes -- they allow me to lift objects beyond the limitations of my natural abilities. For the price of a beer, I can purchase an author's lifetime of wisdom. There is no better investment. But how do you maximize the return on this investment? In a world where free time is at a premium, how do you make sure you're squeezing every last drop of information from the books at your disposal? Yes, there are techniques guaranteed to double or triple your reading output. Yes, there are tools like Blinkist, which break books down into easily digestible summaries. But are these resources really the answer? Reading should be about comprehension and retention, not lightning speed or high-level overviews. When I tried speed reading, I found myself focusing on applying speed reading techniques, not the text itself. I was racing rather than understanding and engaging. And while I enjoyed reading summaries of books on Blinkist, I discovered I was unable to remember what I had learned -- I forgot the summaries almost as quickly as I read them without the surrounding context that reading a whole book brings. So rather than read quickly and pointlessly, I decided to dedicate myself to reading slowly and purposefully. I abandoned speed reading, cancelled my Blinkist account, and started reading with purpose, jotting notes in the margins and engaging in imaginary conversations with the author. I am reading at what most people would consider a glacial pace, yet I still managed to read 65 books within the last 12 months. 1. Find your purpose for reading. If you're finding it difficult to make time for reading, it may be because you don't have a clearly defined purpose. Purpose keeps you focused -- without it you're more likely to quit. So, ask yourself, why do you want to read more? How will your life be measurably different five years from now with 100 books under your belt? I read to get smarter. I read because I will not live long enough to make every imaginable mistake, and books allow me to learn from the mistakes of others. I read because it's the only way that I can have a conversation with the likes of Einstein and Darwin. I read because I want to lead a better life. Distraction is the biggest export of Silicon Valley. When you're combing through Twitter or scrolling through your Facebook news feed, you're not reading to learn. You're reading to satisfy a very real addiction to novelty and information arousal. You don't have to quit social media. But please understand that there is an opportunity cost to everything -- by choosing to do "X," you invariably lose the opportunity to do "Y." And if you're interested in going to bed smarter than you woke up, then you must rethink your priorities. Instead of reacting to endless notifications and social updates, make the choice to read quality content. I used to check my email and Facebook first thing in the morning. Now I read a book to start my day. Instead of knowing about everyone and their mom's lives before 9 am, I devote time to improving myself. I feel happier, inspired, and ready to tackle whatever the day throws at me. I suffer from an incurable condition that the Japanese call Tsundoku. It means "the condition of acquiring books but letting them pile up in one's home without reading them." I'm a master of Tsundoku, and I'm totally okay with it. Being surrounded by unread books gives me ready access to them. Good books are patient. They will wait quietly on the bookshelf until it's their turn to be read. As a result, instead of the remote control or your phone, you might pick up that unread book. Not yet, Ron Chernow's Alexander Hamilton. I know you keep looking at me from that shelf, but I'm not ready for you yet! How do you find great books to fill those empty book shelves? Join my mailing list to receive weekly recommendations. I'll also throw in a free sneak preview from my forthcoming book, The Democratic Coup d'État, and enter you into a drawing to win one of 25 free, signed, and personalized copies. Every January, Jerry Seinfeld does the same thing. He hangs a large calendar on his wall, takes out a red marker, and puts a big, red, satisfactory "X" over each date he writes new material. His goal? To never break the chain through the year, which means writing every single day. You can do the same for reading just by setting a daily goal, getting a calendar, and marking it with those big, beautiful "Xs". The goal can be anything?--?10, 15, 25, or 35 pages?--?as long as it is attainable. Ease of attainment is very important, particularly in the early stages of habit forming. The more easily you can meet your goal, the less likely you are to give it up. IBM's salesmen used to have some of the best sales records, even though their sales quotas were much lower than their competitors. With low sales quotas, the salesmen weren't intimidated to pick up that phone and start making calls. 2. You'll want to keep reading after hitting your goal. 3. Small goals snowball into big accomplishments: assuming a 200-page book, 10 pages per day equals 18 books a year?--?not too shabby! If habit forming isn't your forte, try a web site like Stickk. You set a goal, pick a referee, and make a financial commitment to donate to a charity (or anti-charity) if you fail to achieve that goal. An anti-charity is an organization whose views you strongly oppose. There is no better incentive than a sizable public donation to the National Rifle Association (NRA) for an anti-gun activist to pick up that book and read. By scheduling, I mean physically blocking a time on your calendar. This is time designated for nothing but reading. Treat these "reading appointments" seriously, like you'd treat an important meeting with your boss. You don't have time? Make time. Warren Buffett spends 80% of his time reading and thinking. "That's how knowledge works," he says, "It builds up, like compound interest." If Warren Buffett can devote time to reading, so can you. 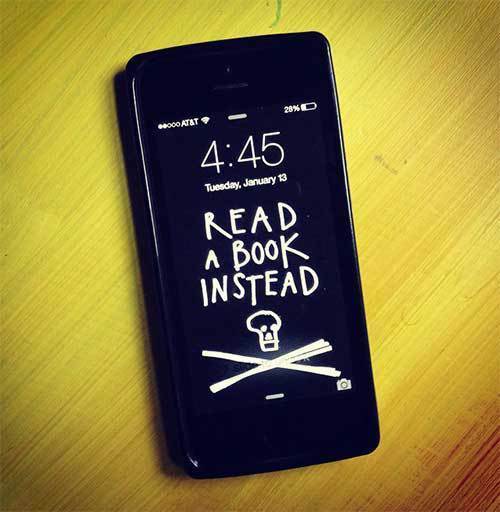 This doesn't work for everyone, but try to read 3-4 books simultaneously. It keeps things interesting. If you get bored from one book, you can switch to the other. Yes, this does mean you will (probably) need to re-read information from time to time, but the process of forgetting and recalling increases comprehension, so know it's not a waste of time. Also try switching between non-fiction and fiction. Ninety percent of what I read is non-fiction, but I always switch to fiction right before going to sleep. I enjoy getting lost in someone else's story to prevent my to-do list from playing on repeat during the evening and inducing insomnia. 7. Carry a book with you at all times. Whether it's a physical book or the Kindle app on your electronic device, always carry a book with you. Down time can appear at unexpected intervals and when it does, you'll want to make a habit of reading. I read everywhere?--?the office, trains, buses, airplanes, the waiting room. You name it. I've read in it. The key is making it easy to access the book, and ease is directly related to proximity. For years, I had a horrific obsession with finishing every book I started. I felt that some invisible being would descend from the heavens and punish me if I left a book partially unread. Unfortunately, there's nothing more discouraging than slogging through a book you don't enjoy. When I dropped this unnecessary obsession, I started to read more...a lot more. Now, if a book hasn't captivated me by page 50, I toss it. Why? Because life is too short to read crappy books. And don't be afraid to skip chapters either. Some books are not meant to be read in-full, and some chapters are better left unread until a future date (which may never come). 9. If you're on the fence, go for print over electronic. This is a topic that arouses unnecessarily visceral reactions, and you should pick whatever format makes it easier for you to read. But if you're on the fence, read the print version. Print comes with no distractions. While reading on your iPad or Kindle, you might be lured into surfing the Internet or reacting to the bombardment of notifications that can distract you from reading. If you don't have the print version, switch your device to airplane mode so you can read uninterrupted. 10. Get a lap dog. First of all, dogs are great. But second of all, when lap dogs fall asleep, your only choice is to keep reading! Here's a photo of me reading with Einstein, my Boston Terrier. Now that you're motivated to read, let's find you some books. Click here to receive weekly recommendations from me. I'll also throw in a free sneak preview from my forthcoming book, The Democratic Coup d'État, and enter you into a drawing to win one of 25 free, signed, and personalized copies.